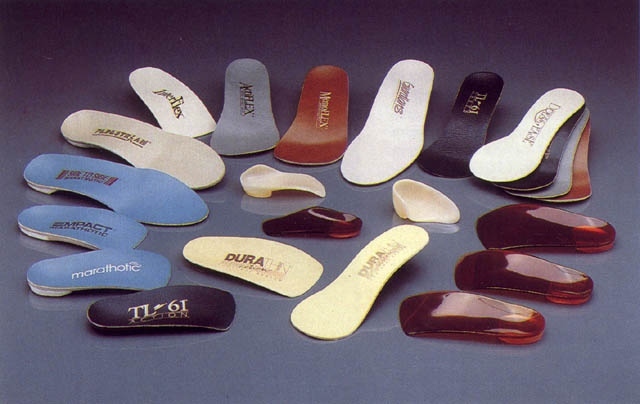 Prescription biomechanical foot orthotics are designed and manufactured according to your exact needs. With today's technology they can be made to fit easily into a men's or ladies dress up shoe, running shoes, walking shoes, golf shoes, comfort sandals and even BIRKENSTOCK sandals. Ideally, prescription Orthotic devices should be worn at all times for best therapeutic results and relief of symptoms. With the help of properly prescribed Orthotic devices your feet can begin to operate in a more natural and efficient manner. Foot pain and dysfunction is usually the end result of faulty relationships between muscles and bones in your feet. Your feet and other parts of your body become overworked and damaged, trying to compensate for disorders in the anatomical alignment of your foot’s skeletal structure. Pronation (when your ankles roll in excessively when you walk), flat feet, persistent ankle sprains, heel and arch pain, bunions, corns, calluses, knee, hip, back and neck pain are all common symptoms. Orthotics are designed to gently and consistently force your feet to function properly - avoiding the stress and strain that causes foot, leg and postural pain. Our Orthotic devices are Custom Made and are prescribed following a necessary biomechanical examination including a weight bearing and non weight bearing evaluation, foot alignment and leg relationships, gait analysis and finally plaster casts (moulds) are taken of both feet. Based upon our evaluation and your footwear and athletic or occupational needs the appropriate custom Orthotic devices are prescribed and fitted. All of our Orthotics are manufactured and regulated by a laboratory approved by the Prescription Foot Orthotic Laboratory Association (PFOLA). To ensure the most accurate, versatile and comfortable devices possible, computer assisted design (CAD) is utilized in the manufacturing process. At our office we provide a no obligation consultation for patients interested in or requiring Orthotic devices or Orthopedic footwear. BEWARE, many unregulated persons without proper training claim to make or fit Orthotic devices. Beware of imitations and inferior products that may cause more harm than good. Ensure that the one treating your feet is a duly qualified and licensed CHIROPODIST.